As a Checkatrade partner we have passed a series of rigorous background checks. These include an onsite visit and interview, criminal background checks, insurance verification and confirmation of our professional associations. These are all designed to ensure we are a professional and reputable company. Before endorsing us, they also checked our performance with some of our previous customers and checked the quality of our work, including reliability, tidiness, courtesy and workmanship. Therefore the Checkatrade badge is more evidence of the quality of our removals and storage services. We are also members of the British Association of Removers and are ‘Approved’ by Kent County Council Trading Standards. Hence, these associations give you peace of mind that your house or piano move and storage is in safe hands. Consumer reviews provide another benefit. 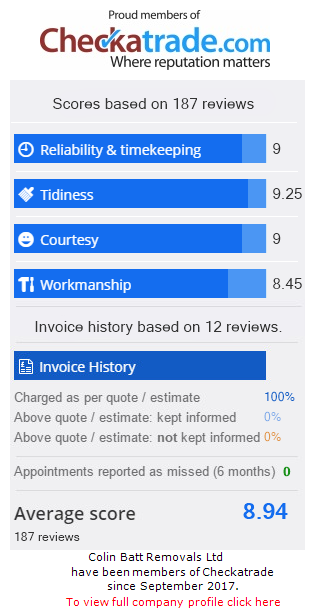 Checkatrade independently organise customer feedback and any customer can leave a review. Every review is verified and published, the good and the bad. This means you get a true picture of the quality and professionalism of our Company. You can see the summary of all our reviews in the sidebar to the right. Checkatrade are committed to protecting consumers, supporting legitimate business and solving the UK’s rogue trade problem. Therefore, by working with them we hope we can continue to increase the standards in the removals industry. We are proud to be members of Checkatrade. We hope it assures you of our high quality removals and storage services, as well as our commitment to customer satisfaction. Click here to see our profile or to leave a review.